Gap's first solo album just re-released on CD! Chuck Mangione, Conductor; Snooky Young, trumpet, flugelhorn; Marv Stamm, trumpet, flugelhorn; Clark Terry, trumpet, flugelhorn; Wayne Andre, trombone; Tony Studd, trombone; Paul Faulise, bass trombone; James Buffington, french horn; Earl Chapin, french horn; Jerome Richardson, soprano, alto, baritone saxes, flute; Joe Farrell, tenor sax, flute; Frank Wess, tenor sax, flute; Ned Corman, baritone sax, flute, bass clarinet; Ray Beckenstien, flute, piccolo; Sam Brown, guitar; Mike Manieri, vibes. This was my first “solo” album. Although we were very excited about the recording while we were producing it, only hindsight has made clear the historic importance of this album in terms of the music, the musicians and the influence it had on some significant music that followed. In August, 1968, my goals were to create an album of the music we were playing five nights per week at The Other Side of the Tracks, a supper club in Rochester, NY, and to present some new compositions by my brother, Chuck Mangione. My group at the time included two young musicians, bassist Tony Levin and drummer Steve Gadd. Until then, the foundation of my musical interests, performances and recordings had been jazz and standards. With this group I was able to explore and add new and exciting elements from rock, Brazilian and then-current pop music. I was also very interested in new music that Chuck was creating. In Rochester, the response to our playing this mix of musical styles was immediate and very positive. The club, with our group playing there, was so successful that there were lines of people waiting to get in, even during the week. Chuck and I had always composed and arranged for the groups we put together. We also did most of the composing and arranging for our Jazz Brothers dates on Riverside, did most all of the material for our various big bands and Chuck had written for Art Blakey with whom he toured and recorded. But in 1968, it was clear that his writing had taken a wonderful new turn – melodically, harmonically and stylistically – as represented by his work here, two years prior to his landmark Friends & Love album with the Rochester Philharmonic Orchestra. Until Feels So Good nine years later, the majority of his recordings consisted of music in a style that germinated and was introduced here. This was the first NYC recording session for Tony Levin, who eventually recorded five albums with me, four with Chuck, and played with Herbie Mann, Gary Burton, John Lennon, Paul Simon, King Crimson and Peter Gabriel among others. He has a 2003 Grammy nomination. It was one of the first for Steve Gadd, who subsequently appeared on six albums with me, eleven with Chuck, and has played with almost every important figure in jazz and pop music including Chick Corea, Paul Simon, Steely Dan, Stevie Wonder, Paul McCartney, Aretha Franklin, James Brown, Frank Sinatra, Michael Jackson, Luciano Pavarotti and Eric Clapton. Snooky Young played lead trumpet with Jimmy Lunceford and Count Basie and was on staff at NBC; Clark Terry played with Basie, earned his historic jazz soloist reputation during his ten years with the Duke Ellington Orchestra and became a popular fixture with The Tonight Show band (he solos on Longhair Soulful); Marvin Stamm played with Stan Kenton, Woody Herman and Thad Jones-Mel Lewis; Wayne Andre with Woody Herman, Quincy Jones, Benny Goodman, Frank Sinatra and Steely Dan; Paul Faulise recorded with Charles Mingus; and Tony Studd with Gil Evans and Wes Montgomery. Jerome Richardson, a great jazz soloist, worked with Charles Mingus, Quincy Jones and Thad Jones-Mel Lewis; Frank Wess, who had eleven years with the Basie band, is considered the first of the modern jazz flutists; Joe Farrell, a Downbeat poll winner, played with Maynard Ferguson, Thad Jones-Mel Lewis, Elvin Jones; Jimmy Buffington and Earl Chapin had recorded with Miles Davis and Gil Evans; Mike Manieri, involved in the creation of White Elephant, had a substantial jazz career as a leader; Ray Beckenstein recorded with Louis Armstrong, Stan Getz and Miles Davis; Sam Brown played with White Elephant and Gary Burton; Joe LaBarbera later played with Chuck Mangione, Bill Evans and Tony Bennett; Ned Corman become a prominent educator. Manny Albam, a superb composer and arranger, contracted the players and was our "ears" (and cheerleader) in the control booth. The sessions took place at Phil Ramone's A&R studios in New York City in August, 1968. We had two three hour sessions with the big band and one three hour session with the trio. In November, 2002, rapper Talib Kweli included a 4 minute sample of Boy with Toys from this album (over which he raps) on his CD, Quality (Rawkus) – they call the track Shock Body – bringing full circle the marriage of the timeless music on this album with the contemporary music of today. Many who listen to this recording for the first time will be hearing a new sound. Knowledgeable Rochesterians who are devotees of modern American music, however, will be hearing in a new setting a blend of familiar sounds – the vibrant, driving music of the Gap Mangione Trio coupled with the sensitive composition and superb orchestration of his brother, Chuck Mangione. Individually and together, Gap and Chuck Mangione have been making their mark on both the local and national music scenes for many years, despite the fact that they are both young men. After having developed an enthusiastic following in upstate New York, their jointly-led sextet "The Jazz Brothers" was introduced nationally on Riverside Records in 1960 with the prediction that it represented ". . . an incredibly mature and richly talented unit that seems destined to make a long, deep and wide impact on the jazz world." The present recording demonstrates yet another proof of the validity of that prophecy. For five years from the date of that recording, the Jazz Brothers continued to perform both locally and on tour, their schedule coordinated with that imposed upon Gap and Chuck by musical studies at Syracuse University and Eastman School of Music in Rochester respectively. Their formal studies behind them by the spring of 1965, the brothers embarked independently in new directions, which for Chuck included playing with and writing for some of the foremost jazz groups in the country, and for Gap meant the forming of a unique trio consisting of piano with bass and conga drums. Gap‘s aim in structuring the sound and style of his trio was to create a group, universal in appeal, whose material, be it old familiar tunes or the latest hits, bears the unmistakable stamp of the Mangione sound. The commercial viability of the trio‘s ubiquitous appeal was seen at once by two long-time followers of Gap‘s talents who were contemplating adding a music-oriented supper club to their chain of very successful restaurants. "The Other Side of the Tracks" has emerged as both Rochester s most successful east side night spot and an ideal showcase for the Gap Mangione Trio. The present recording demonstrates convincingly the several facets of the Mangione style. Intermixed are tracks demonstrating the same happy, swinging trio sounds which delight patrons and fans nightly at the Tracks; pieces showcasing Gap‘s keyboard style in almost symphonic settings composed and scored by Chuck Mangione; and several trio-plus-big-band flag wavers undoubtedly included to prove the point that "to swing is fun." The trio features as supporting artists Tony Levin, a young (21) bassist from Brookline, Massachusetts whose superb playing on both acoustic and electric bass has been the harmonic mainstay of the trio for the past year, and Steve Gadd, a young (23) drummer from Rochester whose playing has brought him not only an enthusiastic crowd of fans in upstate New York but also favorable notice and offers of employment from several very respected names on the national scene. The reasons for this are amply evidenced on this recording. Featuring Gap on not only piano but also electric piano, the selections are typical of the carefully crafted "head" arrangements, the pop-rock influence, and most important the unity and precision of execution which have given Gap and the trio the reputation they enjoy with fans of all ages. The five tracks composed and arranged by Chuck Mangione almost defy categorization. They represent an amalgam of seemingly disparate elements – rock, big band jazz, solo improvisation, and "classical" music – compounded into what can only be termed modern American music. In this recording, the Gap Mangione Trio is joined by fifteen fine musicians under the baton of Chuck Mangione. It is these tracks particularly which should prove real eye-openers to those unfamiliar either with what is happening in modern jazz music today or with the tremendous talents of Chuck Mangione. Three of the remaining tracks are excellent examples of the excitement which can be generated when a swinging trio and a great band get together. Whether dancing, finger-popping, or just listening be your forte, it is appropriate here. The final selection – St. Thomas – deserves special mention, as it is a showcase for the "fourth" member of the Gap Mangione Trio, conga drummer Dhui Mandingo. Having been a featured performer with the Trio since 1965, Dhui‘s African-based and jazz-and-latin-influenced style have amazed and impressed many listeners in solo performances such as that recorded here. The "regular" drummer on this track is Joe LaBarbera who returned to Rochester from a road tour just as this recording was made, to take over the drum chair in the Trio from the service-bound Steve Gadd. 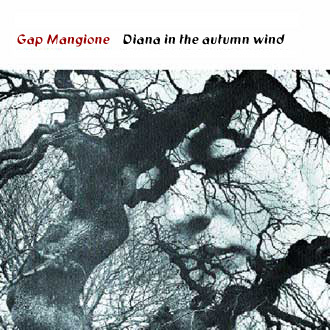 This recording thus provides a good cross-section of Gap Mangione‘s piano style in several settings. The tunes may be old or new but the music is young – modern American music at its finest. Special thanks to Chuck Mangione, for your love and for your music. And to Peter Heinrich, for your friendship and support then, now and all the great times in between. In memoriam: Durward Childers (Dhui Mandingo), Barry Cummings, Manny Albam, Jerome Richardson, Joe Farrell, Jimmy Buffington, Sam Brown, Lou Ouzer.